Hong Kong protests in 60 seconds Jump to media player The story behind the Hong Kong protests - in 60 seconds. Hong Kong 'turned into battle zone' Jump to media player Police in Hong Kong have clashed with hundreds of pro-democracy protesters who were trying to surround government headquarters, the BBC's Martin Patience reports. Police and protesters in Hong Kong 'stand-off' Jump to media player Fresh clashes between police and pro-democracy protestors have broken out in Hong Kong. Protest clashes at HK legislature Jump to media player Clashes took place between Hong Kong police and a small group of protesters who tried to break into parliament early on Wednesday. HK students 'respect the law' Jump to media player Court bailiffs in Hong Kong have cleared part of a pro-democracy protest camp in the Admiralty district. 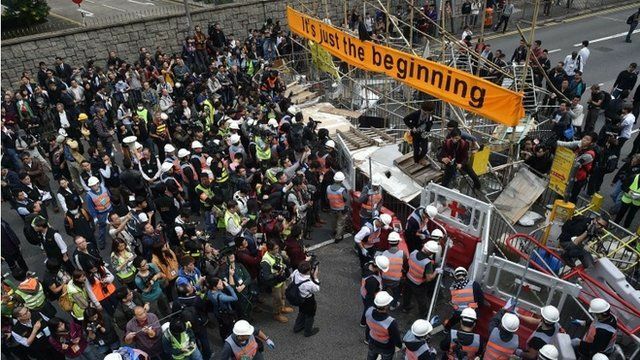 Bailiffs backed by police in Hong Kong have started to pull down barriers put up by pro-democracy campaigners in a part of the city they have been occupying for more than two months. A deadline for them to leave came and went earlier on Thursday but many of the protestors refused to go. The number of protesters has dwindled to a few hundred from its peak of tens of thousands two months ago.